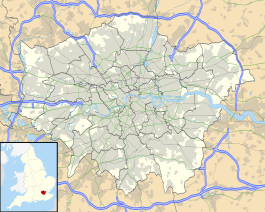 Brockley Hill was a proposed London Underground station in the Brockley Hill area of north London. The planned location is in what is now Edgware Way Grassland close to Edgwarebury Park on the north side of the junction of Edgware Way / Watford Bypass (A41), and Spur Road (A410). Brockley Hill station was to be located on a viaduct to the north of the existing junction of Edgware Way and Spur Road. The T-junction was to be reconstructed as a roundabout to incorporate a forecourt for access to a curving range of shops and a continuation of Spur Road heading to the north-east to a new housing development. The station was designed by the LPTB's architectural department in conjunction with the estates department of All Souls College. [n 4] The station platforms were to be on the viaduct and on a bridge over Spur Road and were to be long enough for nine-car trains being planned for the new Northern line service. The ticket hall was to be located under the bridge with stairs up to the platforms and provision for escalations to be installed later. The station was to be provided with a parking for 20–25 cars. Construction on the Northern Heights project began in the late 1930s but was interrupted by the Second World War. Most of the work to that date had been carried out on LNER branch tracks, but work between Edgware and Bushey Heath had started in June 1939. The route of the line had been cleared and laid out and some earthworks and tunnelling carried out between Edgware and Elstree South. At the site of Brockley Hill station and south of Edgware Way, construction of the piers of the viaduct had begun and three out of 12 arches at Brockley Hill station had been completed by August 1939. Following the outbreak of war in Europe, work on the station and the extension was suspended in September 1939 and was formally terminated in December of the same year as wartime funding restrictions would prevent completion. During the war years, the LPTB-owned land was used for farming vegetables for staff canteens. The sites of the new stations were semi-rural and, as elsewhere, it was intended that the new section would stimulate the construction of housing estates that the stations would serve. After the war, new legislation limited expansion of urban areas into the countryside. This created the Metropolitan Green Belt around London and the area covered the Northern line extension. Without housing estates, the line had no purpose and the plans for the route north of Brockley Hill were cancelled in October 1950. The viaduct piers south of Edgware Way were demolished in 1959 to make way for new housing. The completed arches of the station viaduct were partially demolished in the 1960s leaving stumps of brickwork in a field and part of the north abutment of the bridge adjacent to Edgware Way. Earthworks north of the station site parallel with the bypass indicate the route towards Elstree South. The route for the railway north from Edgware station had been reserved through the W&ER's right of way before Edgware station was built. As Edgware developed as a suburb of London following the opening of the Underground station in 1924, the route was left clear of housing. The line was to pass under Station Road and Rectory Lane. It would have then run in a cutting north-west, before cutting Purcells Road in two, where a footbridge was to be provided to connect the severed ends. North of Purcells Road the tracks continued north-west, rising on to a viaduct to cross over Edgware Way on a bridge to meet the viaduct at the southern end of Brockley Hill station. Following the abandonment of the extension, the unused land between Edgware and Brockley Hill was developed for housing with the western end of Heronsgate, Campbell Croft, Shelley Close and the southern section of Sterling Avenue filling the space. ^ A protracted, series of discussions within the LPTB and with other interested parties took place during 1937 and 1938. The original name proposed and used during much of planning stages was "Edgwarebury", linked to the nearby village. This was disliked by LPTB chairman Lord Ashfield because it was three syllables. He proposed a shortening to "Edgebury" though All Souls College, owner of some of the land to be used, disliked this and preferred the name of the village or that of the local landmark Brockley Hill. LPTB managing director Frank Pick suggested "All Souls", but that was considered to be a depressing name by the Commercial Manager, Alec Valentine. "Canons" was considered by the LPTB due to the proximity of Canons Park. If adopted, the Metropolitan line (now Jubilee line) station of that name was to be renamed "Whitchurch". ^ The Northern line's depot at Golders Green and the Northern City line's depot at Drayton Park were poorly arranged and unsuitable for the accommodation and maintenance of the new trains. The LPTB considered constructing a new depot alongside the LNER's line between Finchley Central and Edgware, but could not negotiate a deal with the local authority for a suitable site in time to enable the depot to be built before the new rolling stock was to be delivered. ^ The arrangement of the depot at Aldenham located between Elstree South and Bushey Heath was intended to be similar to that between Oakwood and Cockfosters on the recently opened Piccadilly line extension. ^ At the same time, All Souls College was planning the development of a shopping centre along the existing section of Spur Road. ^ The public announcement of the cancellation was not made until February 1954. ^ a b Horne 2009, p. 42. ^ a b Beard 2002, pp. 60–64. ^ a b Beard 2002, p. 14. ^ Beard 2002, p. 86. ^ Beard 2002, pp. 56–57. ^ Beard 2002, p. 18. ^ Beard 2002, p. 28. ^ Beard 2002, pp. 27–28. ^ Beard 2002, p. 53. ^ a b Beard 2002, p. 72–73. ^ Beard 2002, p. 82. ^ Beard 2002, p. 72. ^ a b Beard 2002, p. 90. ^ Beard 2002, p. 92. ^ Horne 2009, p. 51. ^ Beard 2002, p. 126. ^ a b Beard 2002, p. 127. ^ a b c Beard 2002, p. 132. ^ Beard 2002, p. 32. ^ a b Beard 2002, pp. 32–33. Beard, Tony (2002). By Tube Beyond Edgware. Capital Transport. ISBN 978-1-85414-246-7. Horne, Mike (2009) . The Northern Line, An Illustrated History (3rd ed.). Capital Transport. ISBN 978-1-85414-326-6. Rose, Douglas (2016) . The London Underground, A Diagrammatic History (9th ed.). Douglas Rose/Capital Transport. ISBN 978-1-85414-404-1. This page was last edited on 17 February 2019, at 18:03 (UTC).